Japanese Episode AG 095: "Hanteeru to Sakurabisu! Shinka no Nazo!" American Episode 367: "The Evolutionary War"
Satoshi and his friends are on their way to Tokusane Gym when they come across a set of islands known as the I, Ro, and Ha Islands. On I Island, Satoshi and his friends meet with Odamaki-Hakase, who's in the area studying the branched evolution of Pearlu, a pokemon who can evolve into either Huntail or Sakurabyss. Odamaki-Hakase tells them that all of the Pearlu on Ro Island evolve into Huntail, while all the Pearlu on Ha Island evolve into Sakurabyss. The professor is traveling around to find out why this happens, so Satoshi-tachi decide to tag along. As the gang goes to Ro Island and Ha Island, collecting water samples, they find themselves being followed by two Pearlu trainers named Namiko and Kikuma. Namiko wants her Pearlu to evolve into Sakurabyss and Kikuma wants his Pearlu to evolve into Huntail, so when Odamaki-Hakase informs them that the water on each island contains items that help the pokemon evolve, they decide to return to these islands. The gang travels back and collects a Deepseatooth and a Deepseascale and use them to evolve the two Pearlu. Suddenly, the Rocket-Dan appears to kidnap the pokemon, but Namiko's Sakurabyss and Kikuma's Huntail are able to send the Rocket trio blasting off. Now that the mystery of the I-Ro-Ha Islands has been solved, Satoshi and his friends continue on to their next destination. Y'know, if you're going to rehash the plot of an older episode, wouldn't it be better to rehash a better episode than "Whichever Way the Wind Blows," one of the worst Jouto episodes? Bah, I'll never understand the Japanese producers. You can also see one of the little girls from "Hypno's Naptime" during the classroom scene (she's on the far left). The English version has a few weird edits, but other than that it's pretty boring. I'm actually surprised that 4Kids didn't break out their digital paint buckets to change the katakana symbols the rocks on the various islands into the letters A, B, and C, but I guess they figured that it would take too much time and effort to bother with. 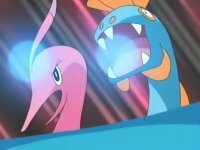 Huntail can be added to the list of pokemon whose voice got changed for the dub despite the fact that it has the exact same name as it does in Japanese. 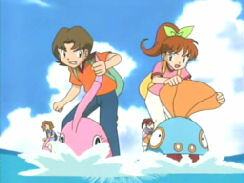 Whaleko, however, keeps its Japanese voice during the brief moment it appears in the beginning of the episode. And the title screen is shortened by two seconds. Surprise surprise. During the first Rocket-Dan battle, there's a shot of Heigani hitting Habunake on the head with its Crab Hammer attack (right before Sabonea jumps up and hugs Kojirou). In the dub, the actual hit is covered up by that full screen impact star 4Kids likes to use to censor things like this. 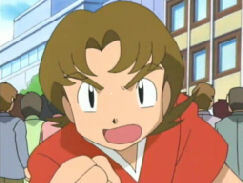 Jessie, James, and Meowth: "You're wasting your time!" Jessie: "Cuz what you seed is what you get!" It wouldn't be so lame if "What You Seed is What You Get" wasn't used as an episode title last season. Hey, we haven't had one of these since "Jump for Joy" back in Season 6. 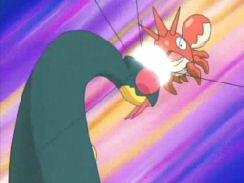 In the Japanese version, the second Rocket-Dan battle ends with Namiko orders her Sakurabyss to use Confusion, followed by Kikuma ordering his Huntail to use Screech. Then Satoshi steps in and has his Pikachu use Thunder attack, which causes the Kingler Z mecha to explode and send the Rocket trio blasting off. In the dub, however, the order of the last two attacks is switched: Nancy has Gorebyss use Confusion, Ash has Pikachu use Thunder, and then Keith has Huntail end things with Screech attack. 4Kids switched the footage to make it look like Huntail's Screeh attack was the one that sent the Rocket trio blasting off, not Pikachu's Thunder attack. So why did they do this? It seems like they did this to give Team Rocket an excuse to go through their whole "can you hear me now?" thing as they blast off. Because rearranging footage in order to make references to Verizon Wireless commercials is soooooo worth it. Two seconds are cut from the shot right after Kids' WB! 's final commercial break. And finally, the TO BE CONTINUED... screen is shortened by two seconds.